The Diocesan Archive is located in Archbishop’s House, Southwark, next door to St George’s Cathedral. The Archive holds the episcopal and administrative records of the RC Archdiocese of Southwark from the foundation of the Diocese in 1850. 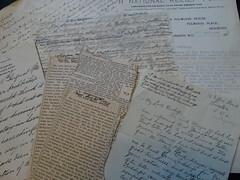 The Archive contains a wealth of material from the establishment of the Diocese to the present day. The records include the papers of the bishops/ archbishops; material relating to finance, property and education; chancery records; files on religious houses and seminaries; parish files; deanery records; information on Southwark clergy; and records on St George’s Cathedral. There is also a small collection of early printed books, predominantly works of theology and church history, and complete series of Southwark Diocese publications such as The Southwark Record and the Southwark Catholic Directory. 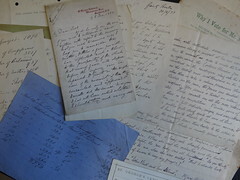 The Southwark Diocesan Archives is currently undertaking a major project to list and catalogue its collections. At the moment box lists exist for all of the collections. Once completed, the catalogue will be made available via this website. Parish registers (baptism and marriage) are held by the local parish churches and not by the Diocesan Archives. Please contact the relevant parishes for enquiries (contact details for parishes can be found on the 'Southwark Parish Directory' section of this website). Registers over 100 years old are currently being digitised by Findmypast.co.uk and will be available on their site in late 2019. For information on the registers of the Metropolitan Cathedral Church of St George's, please email archives@stgeorges.org.uk (these registers are looked after by a volunteer and responses may take some time). Researchers are most welcome to use the archive; however, please note that visits are by prior arrangement only. All readers must register and complete an Archive User Agreement form before being granted access to the archive material. In order to do this, you must bring two forms of identification on your first visit. Opening hours: 8.30-1.00 and 2.00-4.45 Mondays and Tuesdays (except bank holidays). While the archivist is happy to respond to simple enquiries, it is not possible for us to undertake detailed research on your behalf. In these incidences, enquirers are invited to visit the archive or to make their own arrangements to carry out the research. Please allow five working days for a response to emails.